Earthenware vase pierced and modelled with large and small chrysanthemum flowers and leaves glazed in natural colours. It is presumed that this formerly had a lid. Impressed seal on base: Kinkōzan zō. At the Exposition Internationale in Paris in 1900, Japanese crafts were badly mauled by the critics as out-of-date, over decorated, and for the fact that the decoration did not reflect the shape; the Japanese had failed to notice the progression of western styles. This was a rude shock to the Japanese who had had such successes previously. In fact this was a somewhat sweeping generalisation for cloisonné enamel, for instance, had developed along western lines. But ceramics had often lagged behind (see the comment on Yabu Meizan's exhibits in 1910). And yet Japan was both an influence upon as well as being influenced by art nouveau as is very evident here. This reticulated vase is only about five years later than the plate descrobed above [EA1992.71]. 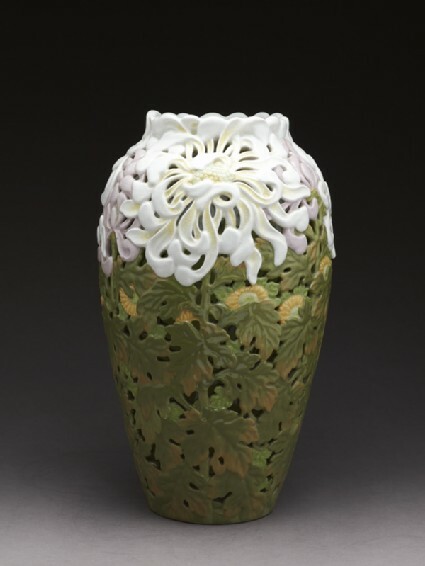 A somewhat similar vase was exhibited at the International Exposition in St. Louis in 1904.